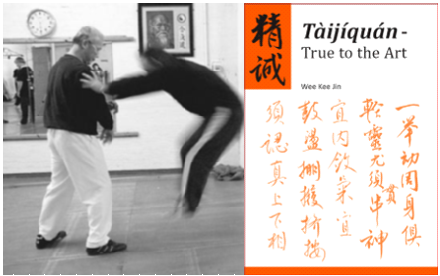 Wee Kee Jin's latest book 'Tàijíquán -True to the Art' is a clear translation and in-depth commentary on Wee Kee Jin's understanding of the Tàijí classical texts. These classics contain the principles common to all styles. The book is also an account of Wee Kee Jin's own Taiji journey, his personal experiences with Master Huang Sheng Shyan and some of the stories told to him by his teacher. Also available is a collection of push hands clips of Master Huang Sheng Shyan, as a 2 DVD set. There are three basic components in partner training: My awareness of my structure and movement, your awareness of your structure and movement, and then the connection between us, manifested in how each of us perceives and responds to our relative changes in direction, position, balance, movement and contact. It is important to draw a clear distinction between your awareness of your own structure and movement, and what you can really only infer is happening to the other person, or of what they are doing, or are about to do. A short article describing the purpose of the White Crane forms and the method of training with them. Article published by the Tai Chi Union Of Great Britain in the Tai Chi Chuan & Internal Arts Magazine (issue 26, Autumn 2008). The author is a student of Wee Kee Jin. The article also appears in abridged form in relation to classical dressage (horse riding) on http://www.classicaldressage.co.uk/html/letting_go.html. An interview With Wee Kee Jin published in the UK magazine 'Martial Arts Illustrated' in 2004 and reproduced here by kind permission of the author. The author is a Bagua practicioner and martial arts writer.